Two drones spotted flying near the runway brought Gatwick airport to a standstill last night with thousands of passengers diverted as far away as Bordeaux. 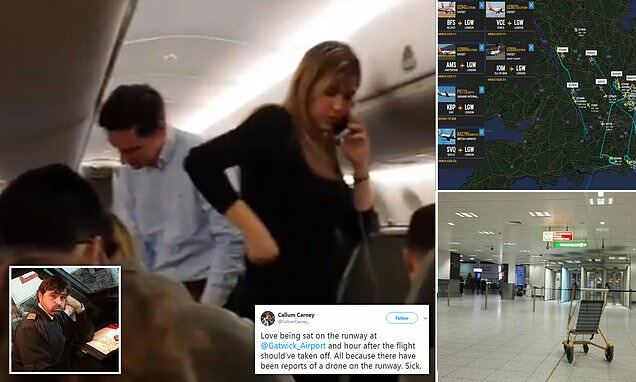 The chaos, which began shortly after 9pm, continued into today with planes still being diverted away from the airport as of 2am, and passengers stuck on the tarmac being taken to hotels near the Sussex airport - Britain's second-busiest. Passengers from the dozens of planes affected took to social media to complain about their travel plans being ruined. Some were diverted to Amsterdam, Paris, Cardiff, Liverpool, Manchester, Birmingham, Stansted and Luton, as well as the flight from Faro in Portugal that landed in Bordeaux, southwest France. Many passengers faced hours-long coach journeys to reach their final destination. Plans to get diverted planes back in the air had seemingly been abandoned early today. Aviation chiefs warned every UK airport in the south-east of England was full to capacity as a result of the shutdown. One easyJet passenger on a flight from from Rome required medical attention after his flight was diverted to Stansted. And some unlucky flyers were stuck circling over Bristol on a Norwegian Air plane before the flight from JFK was diverted to Liverpool. Those planning pre-Christmas getaways could also be affected as the mayhem looks set to spill over into this morning with dozens of jets currently at the wrong airport. Passengers on board a China Airways flight due to take off at 9pm yesterday received an inflight meal while sitting at the gate on board the aircraft at 2am today. A TUI flight from Paphos due to land at Gatwick at 2.30am diverted to Manchester.